Water and electronics normally do not pair well together, for obvious reasons. A small leak and $10,000 worth of circuitry could be fried in a matter of seconds. 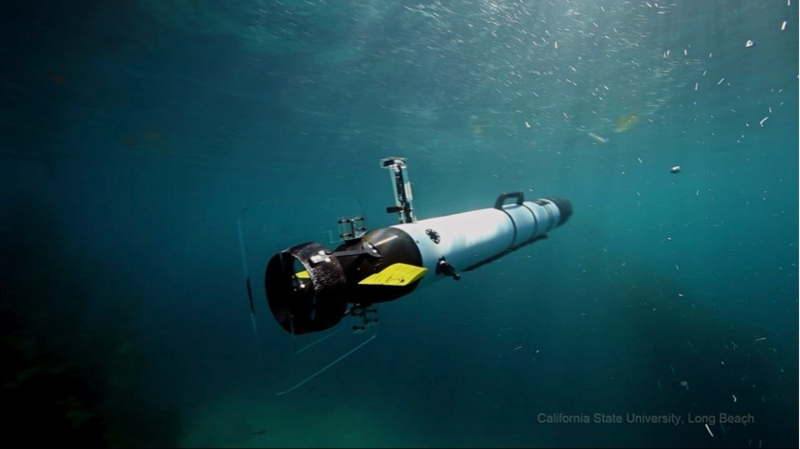 But in order to be able to autonomously track sharks, we make the intersection of water and electronics work. 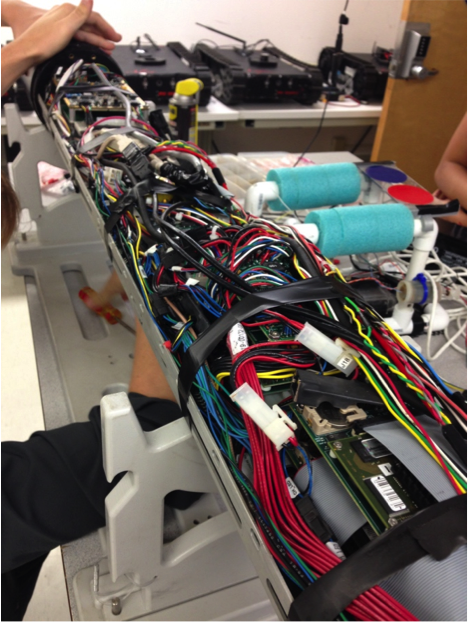 This summer, I’ve been working in a robotics lab at Harvey Mudd College that specializes in underwater robotics. Our lab is known as the Lab for Autonomous and Intelligent Robots (LAIR), and we are partnered up with the Shark Lab at CSULB. We have two autonomous underwater vehicles (AUVs) called Ivers (pictured below). The Ivers are capable of diving up to 100m, have battery life that can last approximately 24 hours, and are programmable to carry out autonomous missions. It is also possible to customize the hardware on the robots according to what types of measurements we are hoping to collect. The reason our research team works at Catalina is to have easy water access for deployments and tag and track sharks. 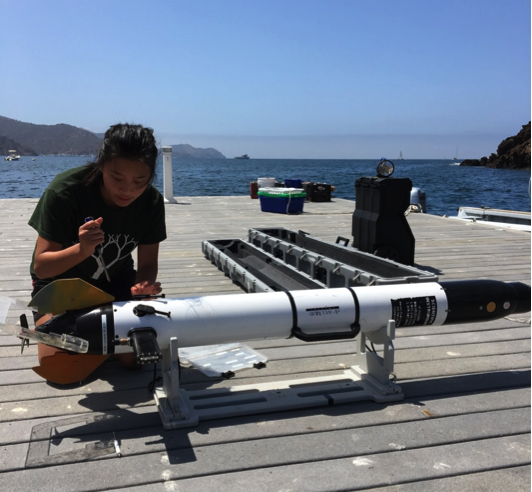 The dock at the Wrigley Institute allows us a convenient platform to deploy and test robot missions and debug whatever hardware issues we may face. The hardware that is necessary for us to track sharks consists of an acoustic tag that is attached to the shark and a set of hydrophones integrated into the Iver that can detect the acoustic signals underwater (both pictured below). The hydrophones can detect the pings the tags send out and record the time stamp and signal strength as they come. We need two hydrophones in order to be able to determine the position of the tag based on time of flight differences between the two hydrophone readings using geometry – this allows us to make sense of the data and extract meaningful information about shark behavior! One thing that I realized after this summer is that field research is tough, in more ways one. Even apart from getting the shark tracking code working, running deployments at Catalina is a pretty difficult process. Lots of planning has to go into packing for our Catalina trips. Getting the robots running requires a lot of tools and equipment – the power remote, a Wi-Fi box, laptop, the antenna, chargers, screw box, screw drivers etc. If things go wrong (which they do surprisingly frequently), we need an entire set of repair supplies – wire cutters, Molex connectors, marine epoxy, multimeter, soldering station, Wi-Fi dongle, servo motors, tape (obscene amounts of electrical tape) etc., and this doesn’t even cover a third of it. We have to make sure that we have all these things, plus spares, are packed and ready to go before every Catalina trip – since we can’t make casual trips to a nearby hardware store on the island. Despite having worked with the robots for almost a year now, it’s hard to predict what can go wrong during any given trip, so we have to try our best to be prepared for pretty much anything. To give you an idea of all the room for error, check out the images below of the Iver while it’s outer metal casing is removed. Intimidating? Yup I feel you, I feel the same way. Although I’ve familiarized myself with most of the hardware inside the Ivers, I find myself going back to the manual and e-mailing my advisor or tech support regularly to make sure I don’t cause 10 other problems trying to debug one (which, for the record, has happened before). I remember when I first started working in this lab, debugging all the random issues we encountered frustrated me to no end and I kept wishing that the robots would work as they’re intended to. But my advisor reminded me that “it’s not research if it works all the time!”, which is a sentiment I’m sure a lot of scientists and engineers can relate to. Working in the field at Catalina has forced us to come up with creative solutions to problems we wouldn’t have even thought to encounter, which I guess is what makes us engineers. 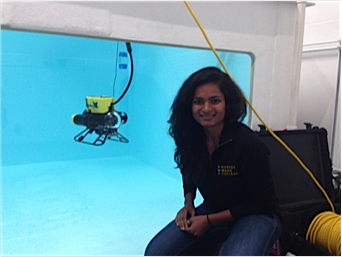 Aishvarya is a Wrigley Institute 2016 Summer Fellow, and a graduate student at Harvey Mudd under Dr. Chris Clark where she is developing new AUV motion planning algorithms. This entry was posted in Graduate, Wrigley Institute on August 17, 2016 by Jessica Dutton. I’ve spent this summer researching new sustainable catalysts as a Sonosky Fellow, supported by the USC Wrigley Institute. A chemical reaction that we try to speed up (“catalyze”) in our lab is the reduction of carbon dioxide (CO2). As you might already know, CO2 is a major greenhouse gas that contributes to global warming due to the greenhouse effect. Capturing CO2 from the atmosphere would significantly mitigate this effect, while reducing the captured CO2 into hydrocarbons, methanol and formic acid would provide us with useful fuels and feedstock materials from this cheap and abundant carbon source. In order to achieve an efficient catalysis for CO2 reduction we use microscopic tools called metal complex catalysts. We make them by reacting metal salts with organic molecules called ligands; the latter are specifically designed to bind the metal salts. The design and construction of these organic molecules require the use of organic chemistry lab techniques and organic synthesis. Organic synthesis is a time-consuming process and, depending on the rate of the reaction, can take several hours to several days. On the picture below on the left is shown a typical setup for our syntheses, which consists of a reaction flask where the reaction takes place and a hot plate that is needed to heat up the reaction. Heating is needed for the reaction to occur faster, thus saving us time. Also, since our synthetic methods often require the use of air and moisture sensitive materials, we use a Schlenk line (picture below on the right). It consists of a vacuum manifold that allows us to remove air from the reaction flask and an inert gas manifold. The latter carries an inert gas (a gas that is unreactive) such as nitrogen and argon to the reaction flask, making sure no air from the outside can come in contact with any of the reacting materials. Once the ligand is obtained, it is reacted with a metal salt in order to obtain a metal complex. After isolating the complex we need to see how it looks structure-wise. 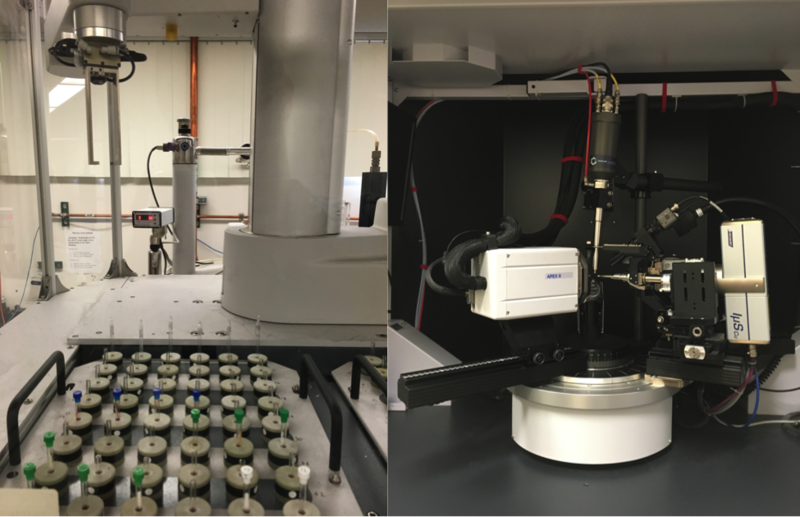 For this purpose we employ nuclear magnetic resonance (NMR) spectroscopy (picture below on the left) and X-ray single crystal diffraction (picture below on the right). The latter uses X-rays to let us see how atoms are actually arranged in a molecule. After structural characterization, these metal complexes are ready to be tested as catalysts for the reduction of CO2. But that is a whole another story for another semester! 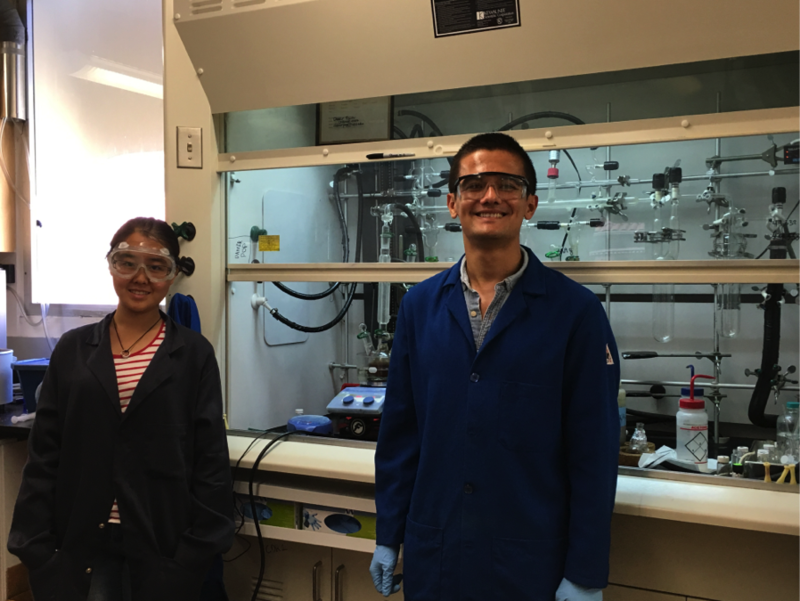 Damir Popov is a PhD student in the USC Department of Chemistry, working in the research group of Dr. Smaranda Marinescu to develop new catalysts for CO2 recycling. This entry was posted in Graduate, Wrigley Institute on August 12, 2016 by Jessica Dutton.